Now that we have completed our general survey of the influences at work to render the English furnishings of the greater part of the seventeenth century what they ultimately became, it is time that we should analytically examine representations of typical examples, which will enable the reader to acquire sufficient knowledge of the form and detail portrayed to decide, without any great degree of hesitation or difficulty, as to the approximate date of any old piece belonging to this period. To the " Elizabethan " we shall look first, making that the starting-point for our studies. Those who still retain sufficient recollection of their schooling to recall the fact that their cordially detested "dates" included the item, "Queen Elizabeth, 1558-1603/' will, if they have followed the preceding pages carefully, deem it somewhat strange that I have classified this style with those of the seventeenth century. I will, therefore, recall the fact that the " Elizabethan " did not attain its full development until after James the First had ascended the throne. It is, of course, true that the style was originated during the earlier reign, and, indeed, was assiduously cultivated in the days of the "Virgin Queen," but it was then young, and had not had time to arrive at full maturity. auction salerooms may regard himself as almost inevitably doomed to disappointment. Even to the vast majority of students they are equally unavailable. 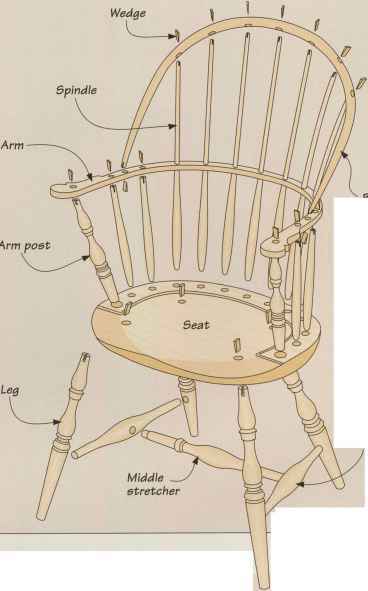 As a natural consequence, most of us must rest content to note the lines of this furniture from such pictorial illustrations as we may be able to obtain, and even they are few. 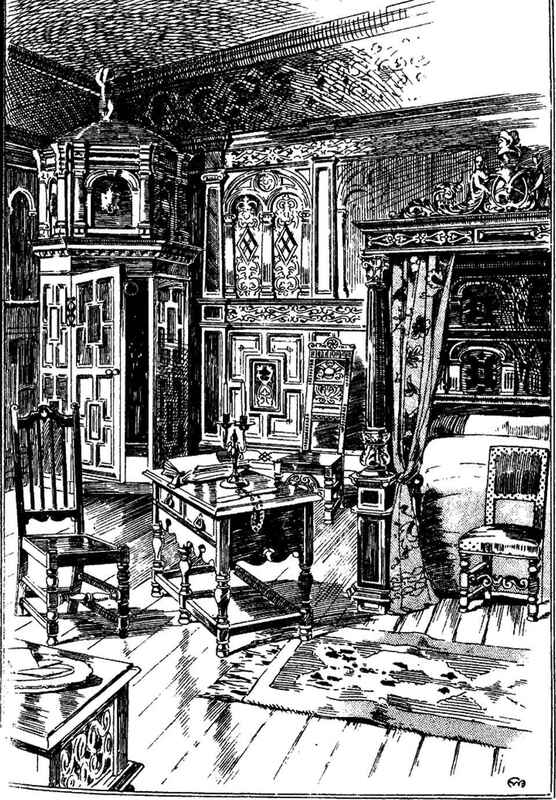 Passing on to our examples, and leaving out of our calculations interior architectural woodwork—joinery, wall-panelling, and the like—we shall see that the most complete object-lessons perhaps in il Elizabethan" carving and ornamental detail generally to be found are the stately and elaborate "four-post" bedsteads—"tester" beds—which have withstood the wear-and-tear of centuries, and bear testimony to the grandeur of the stately homes of England of the days when Drake was scouring the seas in pursuit of glory or booty; when Raleigh was revealing to his friends the mysteries of the pipe and the potato ; when Essex was composing his sonnets to his royal mistress; and the " Immortal Bard" was moving the people to laughter or to tears by the magic of his wondrous pen. With the bedstead, therefore, we will seriously commence our analytical and comparative study of this period. Speaking of old furniture whose interest is supposed to be enhanced by some particular association, it is said that Charles Dickens, in a letter to a friend who was an ardent collector, stated, with mischievous glee, that he had discovered a veritable " find," in fact no less a treasure than a chair which " the Duke of Wellington had positively refused to sit in !" But, if we are to place credence in the histories that have accumulated round the sixteenth, and more particularly seventeenth-century bedsteads treasured in country houses throughout the kingdom, it would be difficult, if not almost impossible, to meet with a single one which Good Queen Bess had refused to sleep in ! One and all appear to be honoured on account of the cherished and cumulative tradition that they constituted, at one time or another, the resting-place of that sovereign's precious and august form. If all these traditions be accepted as true, we must come to the conclusion that this monarch cannot possibly have enjoyed many waking hours over and above those occupied by her travels from one mansion to another. 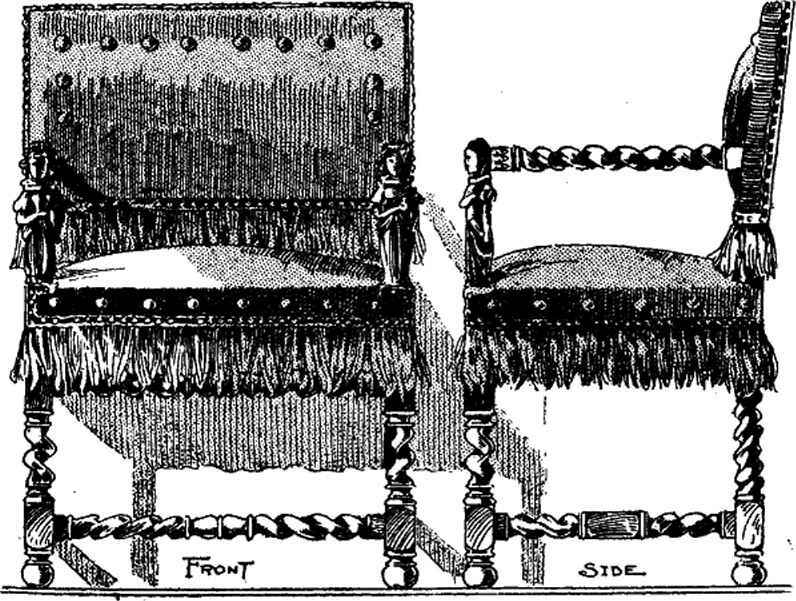 Be that as it may—and the question of the authenticity of such stories does not concern us much—the genuineness of the date and design of the bedsteads is beyond dispute. It will be sufficient for our purpose if we study them carefully as types of style, and leave the verification of the traditions associated with them to others who may be more immediately interested in that question. In our study and analysis of the ornamental detail of the " Elizabethan/' we shall find, as a general rule, that the earlier the date of the piece we have to examine the more refined it will be in every particular. It will bear a closer relationship to the models set up by the Italian and French artists and craftsmen who were brought to this country by the liberality of Henry the Eighth, and by his ministers and court, who desired to enhance the material splendour of his regal surroundings—and of their own at the same time. It will be remembered that I have pointed out how it was not at all uncommon for French and Italian painters, carvers, and other craftsmen of the highest renown, during the sixteenth century to be paid large sums in order to take up their abode in this country for a space, and work in the cathedrals, palaces, castles, and mansions of royalty and the nobility. Hence arose the English Renaissance, or " Elizabethan," as it is more generally styled ; and thus four distinct and most powerful influences were brought to bear in our midst. Netherlands, which played no inconsiderable part in supplying inspiration to the style whose name heads this chapter. That this inspiration was readily and freely drawn from all four sources by the English designer of those times, as well as of succeeding centuries, is amply demonstrated by the work of the period. We sometimes find, indeed, a curious, though by no means unpleasing, combination of the four styles in a single piece of furniture ; in fact, this may be noticed to some extent in the bedstead which appears in Fig. 6, Plate 1., in this chapter. Let us consider this carefully and in detail. The manner of building-up the two pillars at the foot end is, of course, Italian in origin, but it is the Italian idea filtered, so to speak, through the "François-Premier" mind; while the "strap-work" enrichment of the upper part of the shaft partakes of both the " Henri-Deux " and Flemish spirits. The generous proportions of the two rotund, bulbous members of the turning clearly bespeak the English taste of that day. It will be seen, then, that the complete scheme is a real mélange of different styles ; but it must be observed, at the same time, that all these styles, which spring from the same source, are in perfect accord, notwithstanding the many variations of detail to be noted. English carver appears most unmistakably. He had not yet been able to acquire the spirit of the styles which were even then comparatively new to France and Italy, the lands of their origin. In this last carving we have the early beginnings of that type of panel in which more or less crude leafage of a nondescript character, outlined by an interlacing " strap," or plain "fillet" or edging of wood, is arranged geometrically— generally as a quatrefoil. In the course of our study we shall meet with this frequently. Finally, as regards this bedstead, the panelling at the head, in the semi-circular arches, is another medley of Italian and less pure " Elizabethan." I have fixed upon this truly magnificent old example for consideration at the outset on account of the fact that it would be difficult to find another piece so exhaustively representative of every one of the essential factors of the style with which we are now dealing; it conveys, moreover, a remarkably adequate impression of the richness of the domestic belongings indulged in by the wealthier classes of this particular era. bethan"—which, as regards date, it really is ; but, so far as style is concerned, it would be far more correctly classified under the heading " Italian," pure and simple. The detail in every part is just such as we find in the fifteenth and sixteenth century Italian work, unaffected by the foreign influences which came into play at a later period. Of the date of the chest of drawers illustrated by Fig. 3, Plate I., I cannot speak with any degree of certainty, as I have not had the piece itself before me; neither can I vouch for the authenticity of the tables Fig. 6, Plate II., and Fig. 6, Plate III. ; but in style they are as typical "Elizabethan" in every respect as we could possibly wish to find. In all three the "strap-work" element is pronounced, and this should be noted particularly, for it is a distinguishing feature, and one most particularly favoured by the English designers and craftsmen of this period. It is, indeed, rarely absent altogether from true "Elizabethan" creations. I have suggested that this " strap work," as found in the style under consideration, was largely inspired by the " Henri-Deux," but must again refer to the fact that the predominance of that class of enrichment in both the architecture and the woodwork of the Flemish and Dutch Renaissance must also be accounted responsible in a very large measure for its extensive employment in this country. There were other details as well introduced from the Netherlands which must be borne in mind; but fuller reference to them will be made presently. 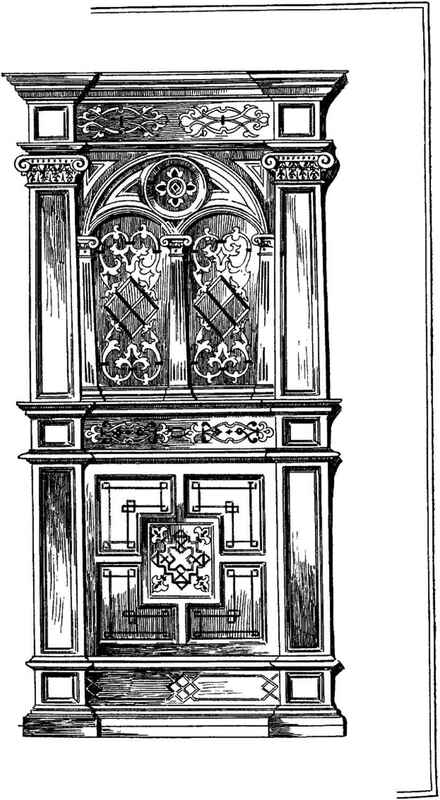 The old cabinet makers of the Elizabethan era did not devote any very great amount of attention to the design or manufacture of articles of furniture specially intended for the comfort of the literarily inclined, but the primitive desk form—the simple box with a sloping lid—was well known to, and produced by, them, though examples are extremely rare. Sometimes it was elevated to a convenient height for writing purposes by being placed upon a table-like base or support, such as we find in Fig. 4, Plate I., and was thus raised, in more ways than one, to a position of some importance in the furnishing of the home. I may here remind the reader that it was no uncommon thing during the sixteenth century, and even earlier, for other cabinet work of the smaller kind— boxes, chests, and the like—to be provided with independent supports from which the box or chest could be removed expeditiously and at will; and the intention of that arrangement is clear. When so supported, they constituted apparently stable, and not unimportant, additions to the furnishing of any room. But, in the days when such impedimenta as "Gladstone" bags and leather travelling trunks were unknown, these articles often accompanied their possessors from place to place; it was therefore essential that they should be more or less portable : hence the adoption of this form of construction. The upper part could be easily carried about—in earlier examples holes were bored through the sides or ends for ropes or cords to pass through—and the stand was left at home for the reception of its burden on its safe return. 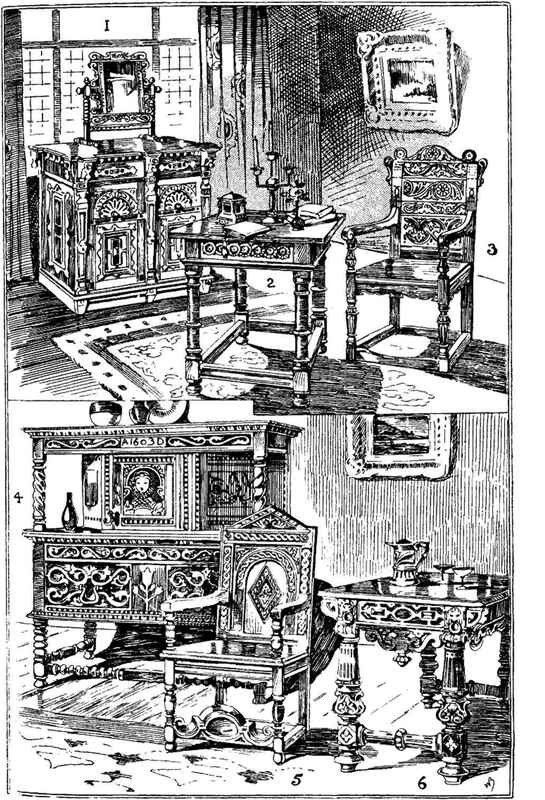 Figure 4 is of this type, and is interesting if only on that account; but it is interesting also in that it really marks the first stage in the development of the simple desk from its original form into that eminently sensible and useful piece of furniture the bureau, which came into such general use at the end of the seventeenth century. In the earliest stages, the lid was hinged at the upper edge, as in the ordinary desk ; but it was not long before some inventive genius struck upon the idea of shifting the hinge to the lower edge, so that the inner side of the lid might be used as a writing surface, as in the bureaux of to-day. The consideration of the supports of this old desk reminds me that a few words on the subject of turning must be said here. themselves so generously of its aid. Instead of a pleasing variety of different u members/' such as is to be found in the turning of the best periods, delighting the eye by their graceful outline and ever-varying play of light and shade, we find the class of work illustrated in the sketches referred to. These pieces called for but limited skill to produce, and could therefore be turned out cheaply, which doubtless accounts for their having been in such common use. With the steady growth of the " Elizabethan," and with French and Italian models before him, the English turner, however, saw that he must attempt more ambitious flights ; how he succeeded in them we shall presently discover. As we still pursue our investigation of the cabinet work of this period, the article that calls . for our attention next is well worthy of more than passing notice, for it must really be regarded as one of the earliest progenitors of the modern sideboard, though its many descendants, in the course of centuries, passed through numerous changes and assumed many forms before they eventually became the sideboards of to-day. It is the " Court Cupboard," then, that we will now discuss; and in Fig. 4, Plate II., and Fig. 4, Plate III., are represented two exceptionally fine old specimens of this particular piece of furniture. side-table, with a cupboard, or chest, placed upon it. The cabinet maker had evidently considered that primitive arrangement carefully, and, having gleaned his idea from it, proceeded to elaborate. 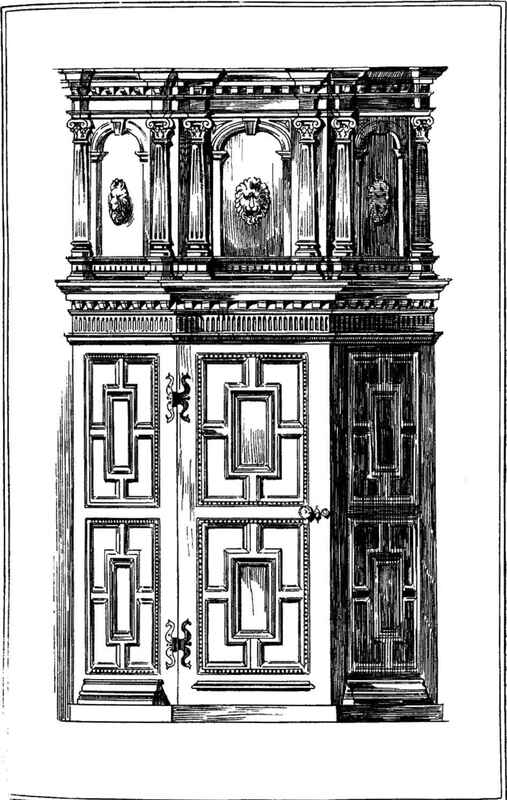 The form of the cupboard was altered somewhat, and it was made a fixture; an ornamental canopy or top was added, and was supported at both ends by the introduction of turned, or square, columns; as a result, yet another piece of furniture, of a type not previously known, took its place in the Elizabethan home. Both the examples illustrated, so far as I have been able to discover, are absolutely authentic in every particular. On the one that appears on Plate II., the date is carved to tell us the precise year of its manufacture ; but the presence of a date, however deeply cut and antique-looking, must certainly not be accepted without question as a sure guide. This feature has been all too often relied upon by unscrupulous imitators—to employ no stronger term—to serve as u corroborative detail calculated to give artistic verisimilitude to otherwise bald and unconvincing" shams. When, however, it is accompanied, as in the case in point, by certain other unmistakable indications of true age, its presence is heartily to be welcomed. simple inlay. Upon the employment of inlay at the time of which I am writing, I shall have more to say presently. The pattern in these two panels, and the border—a "chequer" design—above and below, are in ebony or bog oak, which stands out black against the lighter wood of the "ground/' while the tulip-like form, with its attendant stems and leaves, in the centre panel of the lower part, is of holly, and is, consequently, lighter than the oak into which it is sunk. The turning in this piece, I need hardly point out, shows that, at the time of its manufacture, a greater refinement and more variety in the shaping of members had come into play in this class of -structural enrichment; and special note should be made of the spiral, or " twisted," character of that in the upper part. When once introduced, spiral turning, as it is technically termed, came rapidly into vogue, and was for many years very extensively , employed, and with excellent effect, particularly in the manufacture of chairs, as we shall see in the next chapter. and the superiority, regarded from the technical point of view, of the carving throughout. Both pieces, however, may be considered as belonging to approximately the same period. t the seat, will be seen to form most distinctly the half s>f a B ! I present this important discovery most readily to the Baconian theorists. Can it be another link in the chain ? Who shall say ? 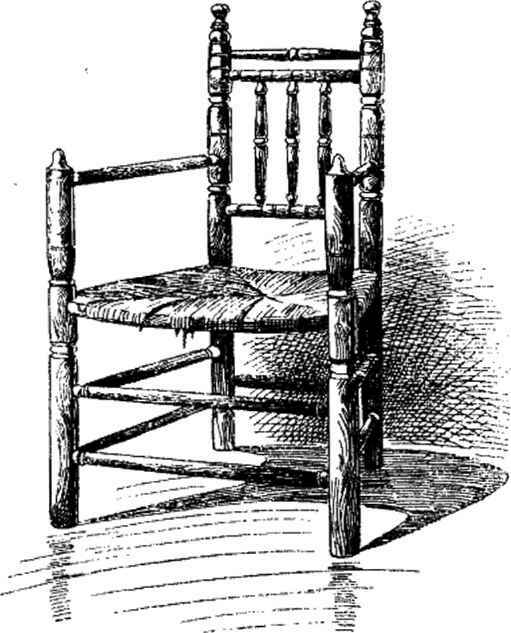 Reverting, with brevity, to the subject of turning as employed in the construction of chairs, the type illustrated on the opposite page is not infrequently found in the Elizabethan, and later, Jacobean mansions. But, more often than not, it was imported from abroad, and cannot be regarded as a home production. 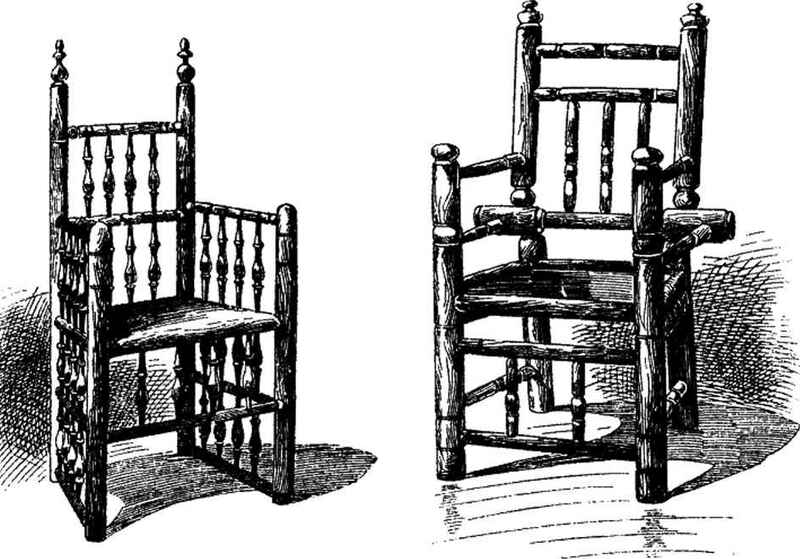 We sometimes see such chairs as these described as " Elizabethan," but their only claim to that description is to be found in the fact mentioned, viz. :—that they won a certain amount of favour in this country during the reign of the sovereign after whom they are thus named. Even if some were actually made here, they were Italian, or Flemish, in form and detail nevertheless.
" Elizabethan " characteristics, and, for that reason, they are not out of place here. This is specially the case with the massive arm-chair, Fig. 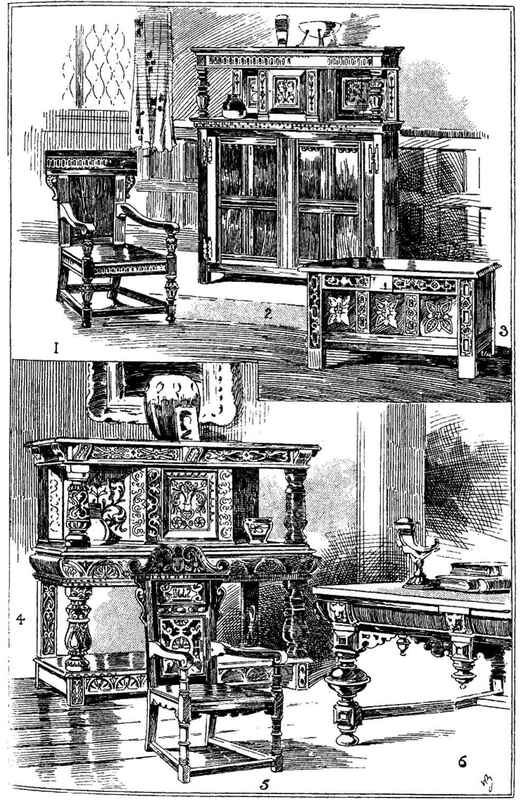 5, Plate III., with its "strap-work"
c and-bye, and I will conclude my remarks on individual examples of the style with brief reference to the cupboard that appears in Fig. i, Plate IL In my opinion this is Flemish work; or, if not exactly from the Netherlands, it is a remarkably faithful copy of a Flemish original. The style of the panels, with their projecting "lozenges'' in the centre; the semi-circular " shells " in the arches above them, and the little turned knobs, "drops," or pendants so freely introduced, taken together with the " building-up " of the pilasters, tell at once of the country of their origin, and mark the design throughout as essentially Flemish. The example itself is only 1 introduced here in order to show the closeness of the relationship which subsisted between the Renaissance of Flanders and that of our own land. 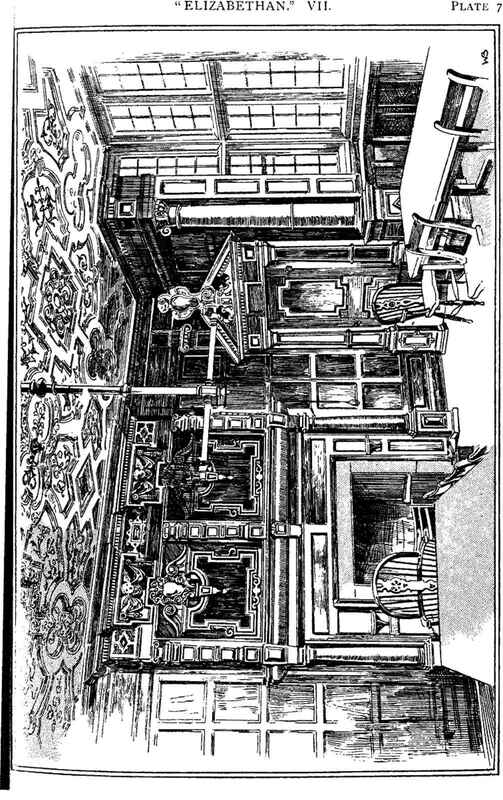 In bringing this chapter to a close, I shall invite my readers to study, for a brief space, a scheme of interior woodwork which will enable them to conjure up in their minds a more complete picture of the inside rf the old Elizabethan mansion as it actually was than they could do through studying mere isolated examples of furniture. gam a truer conception of the beauties of the whole scheme. All the furniture in this room, apart from the bedstead, which has already been discussed, is of a period later than that to which the panelling belongs, and represents various phases oi a style which we must consider in the next chapter. Another fine Elizabethan interior is illustrated on Plate VII. rhis may be seen in entirety to-day in "Ye Olde Reine Deere" Hotel, at Banbury. A cast of the ceiling is in the South Kensington Museum.